GOOGLE PLACEMENT . . . . . . . . . . . . . We Specialize in First Page Organic Google Placement. AFFORDABLE WEB DESIGN . . . . . . . . SEO and Custom Mobile Friendly Web Design. WEB DESIGN AND HOSTING . . . . . . . . Hosting, Email, Domain and Page Updates Included. GOOGLE MAP SUBMISSION . . . . . . . . Google My Business Listing Verification Included. SOCIAL MEDIA MARKETING . . . . . . . . Custom Social Media Campaign Included with Hosting. Google was born in September of 1998. Four years later in 2002, Internet Highway began optimizing websites for organic Google placement. We’ve been optimizing websites for first page Google placement since Google was a kid. Facebook was founded two years later in 2004. Over the last decade, AdWords and map placements have invaded the first page of Google. A lot of SEOs saw this as the end of organic optimization and left the small business sector. The void was filled by big corporations and one man operations. They flooded the market with cheap control panel WordPress websites. You can build a control panel site in an hour, real SEO website design takes weeks. Those programs pump out websites quickly for internet marketing firms, but unlike the custom HTML sites SEOs were building, were never designed to get a website to the first page of Google. This forced small businesses to “pay to play” and spend thousands of dollars per month in AdWords to stay on the first page of Google. We continue providing SEO, affordable web design, and social media campaigns for small business owners. Unlike our competition, we spend most of our money on the back end, the people doing the work, not on outside sales reps. We do not want a bunch of one-time payments from customers that leave unhappy in 90 days. Our main source of income is long term monthly clients and referrals from happy customers. 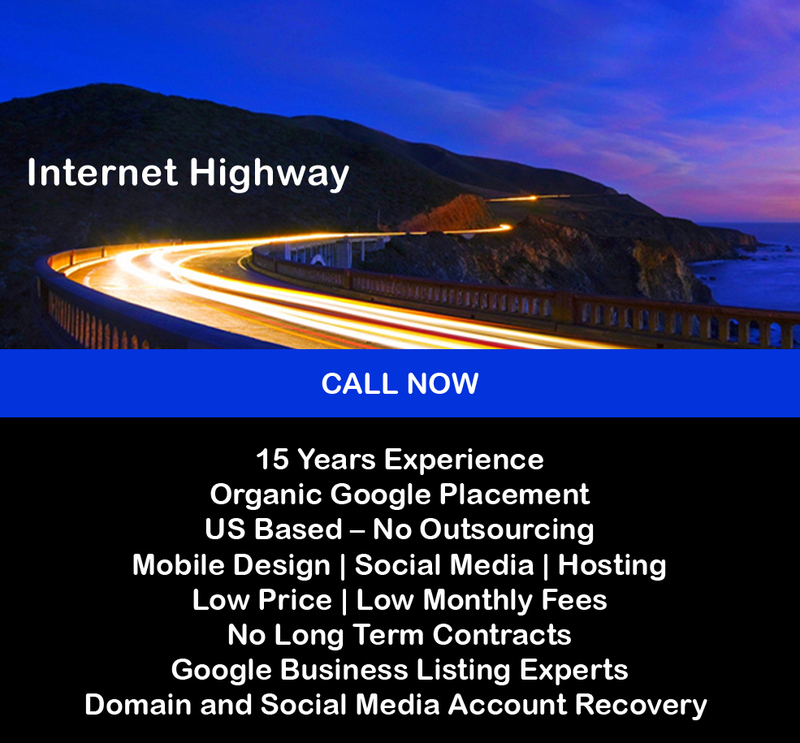 Internet Highway has a vested interest in your success. One of my favorite movies is Sea Biscuit. The internet marketing industry is “profit” not “performance” driven. Every year we work hard to create innovations that help our small business clients compete with big corporations. I love fighting for “The little guy”. 2004 – Guaranteed Google Placement. We were the first, and maybe the only company, to ever offer guaranteed Google placement. Google stopped allowing access to placement report data, so we can’t technically guarantee it anymore. But we still achieve the same results. 2006 – Landing View. We pioneered web designs that do not require paging down to view the main menu or featured content. This increases visitor retention and conversion of traffic into calls. 2010 – Community Social. In addition to posting information about our client’s services on Facebook and Twitter – we began adding posts about local community events. This helps our clients to take their sales hat off and become welcome members of their local online community. 2012 – Mobile / Desktop. When the mobile app craze hit we saw a problem. Mobile apps are only designed for upright or portrait view. 50% of visitors hold their phone sideways when viewing a website. There is no room in portrait view for visitor friendly content, or to display your menu and all your services. We created a design that looks great on desktop, but allows mobile visitors to access your contact info quickly in portrait view and view your entire website in landscape. View this site on your phone. 2018 – Google Now. As Google algorithms advanced, we adapted slight changes to our SEO structure. The result was the ability to achieve first page Google placement even faster. This helps our clients reduce or eliminate AdWords cost. You do not have to be priced out of your market by big corporations and rising AdWords cost. 2019 – Mobile Zoom. Tired of sliding and stretching website pages on mobile to enlarge the text? View this site on your cell phone and click the Mobile Zoom icon. This can dramatically increase your conversion of visits into calls and sales. The site you are looking at is over 15 years old. We spruced it up a little for the New Year, but left a lot of the original information on here, so it’s a little content heavy. We only apply a brief amount of visitor friendly content our client’s websites. We launch our new site first quarter of 2019. Google Placement. We specialize in first page organic Google placement! Are Adwords charges killing you? Statistics show that about 70% of Google visitors use the natural listings or organic placement verses sponsored ads. We specialize in first page natural listing Google placement. Our SEO consultant can help you reduce Adwords cost. We conduct thorough keyword research based on your needs. You approve every keyword we optimize. To achieve first page organic Google placement - you must think like Google. Google and the other search engines want the best sites on the first page. This means every page must contain unique informative content. Short cuts and black hat techniques do not work. It takes time to write good visitor friendly keyword dense content. We write unique content, source code and keywords for every page of your website. This is one of the ways we are to able achieve Google placement in a shorter period of time. SEO Consultant. SEO stands for Search Engine Optimization. Our SEO company in Las Vegas has been optimizing sites across the nation for over 15 yrs. We also specialize in Google My Business support. There are only a few legitimate SEO companies that service the public sector. The average charge for optimization runs about $8000 per site - per year, with monthly maintenance charges averaging $800 per month. We offer better design and organic Google placement for a fraction of the cost. Our SEO consultant in Las Vegas will review your site free of charge and explain the website optimization process in layman's terms. Affordable Web Design. Custom web design can be costly, averaging from $3,000 to $5,000 per website. Our affordable web design or redesign is included as part of your optimization at no additional charge. It is hard to find affordable custom website design. Each website we create is unique and designed to your specifications. We have to access and edit your pages to optimize anyway. Why not save you some money in the process? If you have a website and are considering website redesign - we can optimize and redesign at the same time. This will save you time and money and give you better results. We do not use templates. This is SEO website design. Your website is designed to impress the search engines and your visitors. Our affordable web design will contain visitor friendly pages that can help increase sales and contacts. Our web pages are formatted so that your visitors can view them perfectly in all major browsers at a variety of monitor sizes. If half your visitors are viewing your website on a laptop - the design should show up properly for them as well as visitors with larger screens. Our affordable web design provides you with a better website for a fraction of the price. Increase Website Sales. If you want to increase website sales - you need to tell your visitors three things. One, what you are offering. Two, why are you better. Three, how they can order or get more information. It is amazing how many websites do not have a clearly visible phone number or good visitor friendly content. Most SEO consultants just try to achieve placement. They do not care if you increase website sales. We will help you create visitor friendly pages and content that can help you sell your product or service. Our SEO copywriting team makes traffic conversion a priority. We want you to make money and stay with us as a client. Call today to increase website sales. Web Design and Hosting. Looking for affordable hosting services? We offer free hosting and email to all our optimization clients. We also offer free support. As you can see - most of our affordable hosting services are actually free services we provide at no extra charge to our clients. Imagine having a personal assistant to listen to your needs and do all the work for you. If you have an existing website that you want to move to another domain - we can help with a DNS transfer. We offer dedicated IP hosting to all our optimization clients. Call today for to take advantage of our affordable hosting services. We offer first page Google placement and affordable web design to help you increase website sales. Our web design includes Free hosting, email and domain support. Our mobile web design helps you convert traffic into sales!